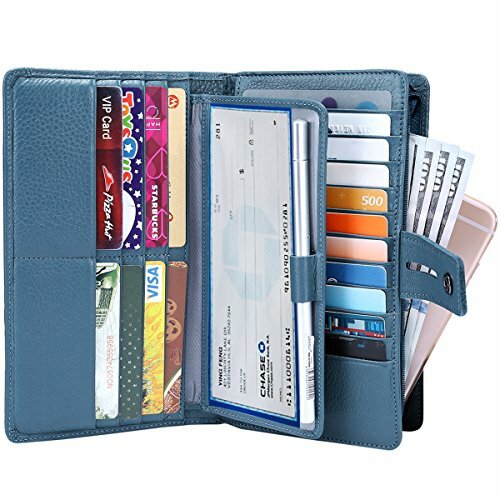 The Itslife Women's RFID Blocking Wallet Big Fat Wallet: This wallet clutch organizer will keep you organized and looking stylish. Womens Fashion Wallet Clatch The Big Fat RFID Blocking Womens Wallet by ITSLFIE is just the thing to keep the woman on the go organized, well prepared and stylish all at the same time. Perfect gift for your loved one, mother, girlfriend. Ideal gift for mother's day, valentine day, birthday, thanksgiving, Christmas, new year and so on. EXTREMELY PRACTIAL:2 in 1 design can make this wallet to meet the variety of occasions and needs,who needs a little more can use together, needs little can just carry slim removable checkbook wallet. EXTREMELY FUNCTIONAL: Plenty of room for 19 credit cards, 1 ID window,1 passport pocket (can fit 2-3 passports),a removable checkbook cover with 1 pen holder(can used as a checkbook wallet),An exterior zippered pocket reveals 2 additional pockets for storage cash, cellphone(can fit iPhone X 7/8 plus)and a zippered coin pouch. RFID BLOCKING TECHNOLOGY: Each wallet is manufactured with RFID blocking technology. Protect yourself from thieves with our RFID Blocking Wallet. Our RFID Blocking clutch will secure your Identity and personal information from RFID scanning devices, skimming devices and electric pickpockets. Dimensions:7.8 x 4.5 x 1.5 inches(20 x 11.5 x 3.9 cm).keep your cards,cash,coins,checkbook,passport,ID,tickets and other documents can all be well organised. GUARANTEED QUALITY: hassle free return or exchange based on find quality and competitive pricing.